Save time and hassle by having us mount your TV for you, hiding wiring for a clean, seamless look. We can install any brand of TV, on any surface, and can advise on the type of TV mounting that would work best for your individual situation. We service clients in the Greenville, SC area. Our 16 years of experience mean that we’ve seen just about every surface and installation challenge possible. You can have confidence that when you hire us, you’ll end up with a beautiful installation. Our crew comes out and professionally mounts your TV and conceals all wires in the wall. For the most streamlined look, you’ll want a fixed TV mount. This type of mount is best suited for displaying your TV at eye-level, directly in front of the seating area, since it does not allow movement of the TV. With a tilting TV mount, you can tilt the TV forward or backward. This ability is helpful when you’re experiencing glare or when you want to place the TV above the fireplace or other higher-than-normal location. A swing arm gives the articulating TV mount a full range of motion. You can move the TV to face any angle, which is useful when installing in a corner inside an armoire. 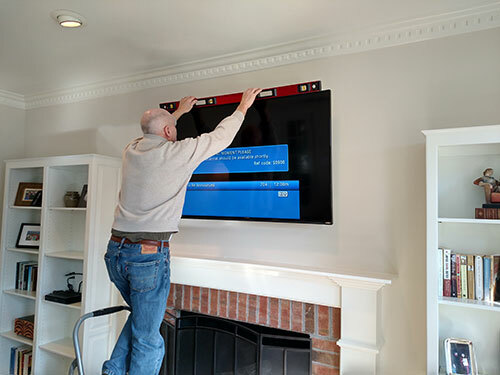 Let Grand Central Wiring professionally mount your TV. Call (864) 881-1675 to talk with us about your project.